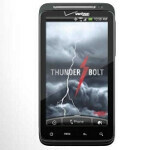 Is this any way for the HTC ThunderBolt, Verizon's first LTE enabled phone, to be treated? Released March 17th 2011 with Android 2.2 on board, the phone was updated to Android 2.3 in September 2011, where it has since been frozen. A tweet sent out on Wednesday from HTC USA tells us that things are going to change and that Android 4.0 is coming to the HTC ThunderBolt "soon". Of course, soon could mean anything from tomorrow to weeks from now. The phone is obviously dated now and Android 4.1 is not going to be made available for the device. The HTC ThunderBolt is no longer available from Verizon. But when it was the pride of Big Red's lineup, the device had a 4.3 inch WVGA display with a single-core 1GHz processor under the hood and 768MB of RAM on board. The rear and front-facing cameras weighed in at 8MP and 1.3MP respectively. Sadly, once the update is completed, there will be no more official ones coming for the HTC ThunderBolt. No matter how buggy the device was at times, it will always go down in the history books as the first Verizon handset to bring you LTE connectivity. You mean, "Trolling this article on my iPhone 3GS running IOS6." Many people claims that iOS 6 on iPhone 3GS and 4 lags. What is your opinion, wendygarett? My friend still has the 3GS running IOS6 and to say it "lags" would be an understatement. Even scrolling through your apps....errr "homescreen" lags, web browsing is a joke, it takes forever to load a page like PhoneArena and even after it is finished, pinch to zoom and scrolling is impossible thanks to an endless checkerboarding. So please tell me, what good this "update" does for your phone, other than make it nearly useless? I used to envy my friend for having the 3GS vs my 3G because how much smoother and faster it was, now thanks to little to nothing updates, it is a complete lag fest. There's no excuse for it, IOS4,5,6 or hardly any different from one another, just some minor changes. It was the first 4G LTE phone. That's why the battery is so bad. Updates are always nice, even if they are a little late. screw that because the samsung device that came out a little after that had much better battery life than the thunderbolt. That was just a very poorly made, designed, and implemented phone. Not to mention HTC and their complete lack of support to stand by and behind their products over the long haul. Tell me about the Droid Charge update history. Oh that's right it didn't get updated. The Thunderbolt has seen much better support than the Fascinate or the Charge. I think this will be the first single core phone to be updated to ICS in the US that isn't a Nexus. They called it the thunderbolt cause you needed 1.21 gigawatts just to check your e-mail. Its the amount of power needed to run a flux capacitor. its not HTC's fault (not all of it)! coz of that damn customize UI! So you're basically saying that it's not HTC's fault but that it is indeed HTC's fault. About time! Glad I don't have that phone anymore... It was good while I had it, but this Galaxy S3 is much better! I wonder how long it will be before big red finally pushes it. I'll bet march 2013. Thats funny considering that I just upgraded to my brand new galaxy note 2 and will proudly never buy another HTC phone again. It figures that after how long they finally send an update. The lack of support that is why never again. No. The HTC Thunderbolt did not have bad battery life because it was VZW's 1st 4G phone. It had bad battery life because it was made by HTC. HTC's always have the worst battery life and its because HTC never puts a decent battery in their phones. HTC stands for Has To Charge. Look at their new DNA. They give it a 1080P display and a quad core! The battery is an after thought as usual. Just a 2000mah when a phone that new and powerful should have something more like a 2500 to 3000 at least. Especially because its not removable. if you look at the battery life tests on the DNA, It did pretty well. and i have an evo 4g lte and i get a day and a half with moderate use, 3/4 of a day with heavy use. HTC = Has To Charge. LMAO!!! Brilliant. You get a thumbs up just for that. Awesome. I will say this though having owned an HTC phone: while their batteries are usually smaller on average than others, their software is usually very well optimized to handle it. thunderbolt? people still carry that phone? man...this article is completely pointless.